This recipe has taken quite a bit of trial and error. 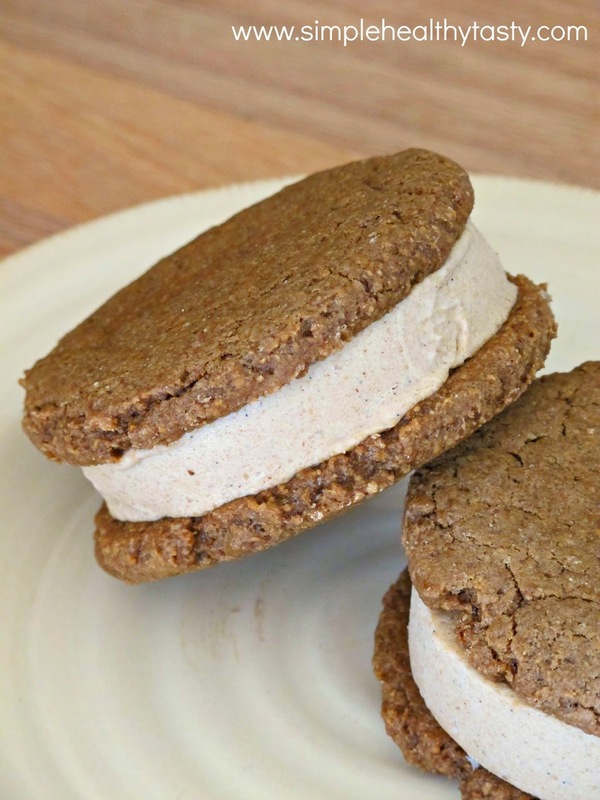 When I first thought it would be fun to make ice cream sandwiches I was sure it was as simple as taking one of my cookie and ice cream recipes and making a sandwich out of them. Nope! We tried that the first time and although they did get eaten they were not the grab out of the freezer and enjoy like the ones I remember. They had to sit on the counter until the ice cream was almost melted for the cookie to be nice and chewy.....and then the cookie still wasn't nice and chewy. Again we ate them but the cookie was crunchy! 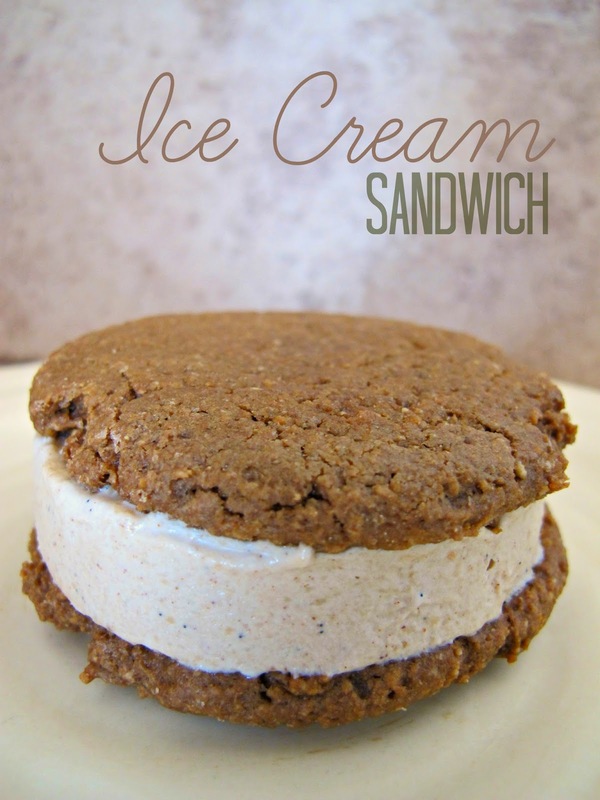 I found too that the ice cream needed to have a softer, creamier texture to really make the sandwiches good. That was easy we just added more fat. If you are looking for a fun way to get lots of medium chain fatty acids in your kids....I don't think you'll have any problem getting them to eat these. Then once we got the right textures down we needed to work on how to easily fill each sandwich. I came up with putting ice cream in the solids end of a Pampered Chef Measure All Cup and freezing it that way. Then I could just pop the ice cream out and slice it. That worked really well but I had more ice cream and cookies then one measure all cup was enough for. So I also found that freezing your cookies first and letting your ice cream soften our of the freezer for just a bit, made it fairly easy just to scoop ice cream onto the cookies. You still have to be careful to not break your cookies though. But see now the trouble shooting is all done for you so it will be a cinch to make now right?........RIGHT! Preheat oven to 375 degrees. Mix dry ingredients in a bowl. Mix wet ingredients in measuring cup (make sure they're blended well). Stir wet ingredients into dry ingredients. Using hands, form dough into a big ball. (If it sticks together well, then its the right consistency. If it's kind of dry and crumbly then add a bit of water, 1 Tablespoon at a time and mix it well. If it's too wet you may add up to 1/2 cup more flour just add it a Tablespoon at a time. You want a sort of sticky dough but not wet just a little greasy you need to be able to roll it into a ball kind of like play dough. )DO NOT over mix or oil can separate out. Form dough into ping pong size balls then gently press with the bottom of a 1/2 cup round measuring cup that is lightly greased with coconut oil. (use the leftovers from the dish you melted the coconut oil in) Press to the size needed or desired. Bake for 5-6 minutes in preheated oven. NO LONGER! You want the cookies not all the way cooked it makes them not so hard after being frozen. Let cool for at least 5 minutes before removing to cooling rack. In blender blend drained cashews and herb tea until smooth. Add coconut milk, oil and the rest of the ingredients to the blender. Blend until just mixed and smooth. Churn and freeze in your ice cream machines according to manufacturers directions. 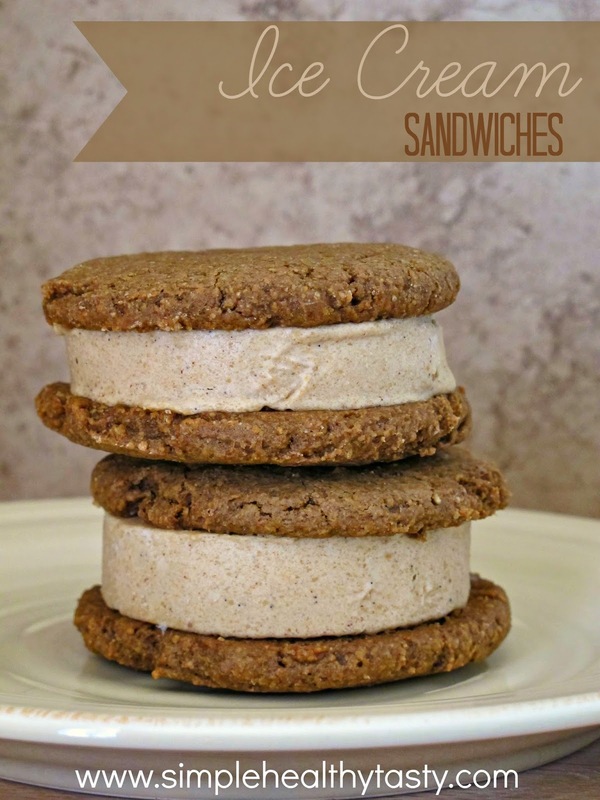 I talk about our ideas for easiest assembly of the ice cream sandwiches in my ramblings above. So if you didn't read those you may want to reference them now. ;) Basically just make ice cream sandwiches out of them obviously store in the freezer. They are best taken out of the freezer 5 minutes before eating. *Here are a few fun flavor ideas that will change depending on the type of tea you use. Be sure to make a good strong tea. If you are using teabags use 5-6 of them. Peppermint: dried peppermint leaves made into a good strong tea. (pour 1 1/2 cups boiling water over about 3 heaping Tablespoons of dried peppermint leaf. Let cool some, strain out leaf use the 1 1/2 cups in the ice cream) You could add carob or chocolate chips to this ice cream when it is almost done churning if you would like mint chip. Mormon Mocha: Dandy Blend(No Coffee for this girl), Carob and/or Cocoa Powder. Pour 1 1/2 cups boiling over 2 heaping Tablespoons Dandy Blend and 1 Tablespoon carob powder. Stir until well combined let cool till just warm use in making the ice cream. Chai: Roastaroma blend and/or Rooibos type tea. (again nothing from the Tea plant so no green or black tea for me) Make a strong tea with 1 1/2 cups boiling water, strain off herbs or remove tea bags. Use in making the ice cream also add these spices. May adjust seasonings to taste. Nutty Vanilla: Just cut up some vanilla beans and make a strong tea with that. Pour 1 1/2 cups boiling water over beans let steep for longer than the other teas. Strain, use this in making the ice cream, you may want to add more vanilla too.